The landing craft Sumber Bahagia Jaya partially sank on 47 nm off Cape Tanjung, Pulau Birahbirahan island in Indonesia. 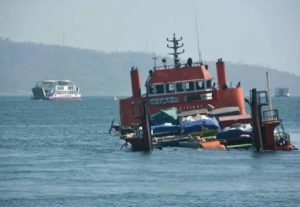 The vessel was en route from Malinau to Samarinda with heavy equipment on board, but started getting water ingress in bad weather and rough sea. The vessel developed list to starboard and started sinking. The crew reported the accident and all jumped into the water, abandoning the sinking vessel. The nearby fishermen and rescue boats started search and rescue operation for the eleven seamen. In the very first minutes were found nine people, all wearing life jackets, but another two are missing. The strong current and heavy seas, forced the rescuers to increase the SAR area down the stream. The local authorities started investigation for the root cause of the accident and why the crew jumped into the water. The vessel partially sank, probably resting the bottom. The salvage operation will be consider after weather improves and SAR is completed. The landing craft Sumber Bahagia Jaya (IMO: 8975249) has overall length of 48.00 m, moulded beam of 11.00 m and maximum draft of 3.50 m. The deadweight of the ship is 500 DWT and the gross tonnage is 365 GRT. The vessel was built in 2000 and operating under the flag of Indonesia. The manager and owner of the landing craft is Indonesian company Citra Permata Bahari. Curious Phenomenon Moves the Sea Away from Some Mexican Beaches.